Use DECK-O-DRAIN to direct run-off water into lawn, garden or drainage area. 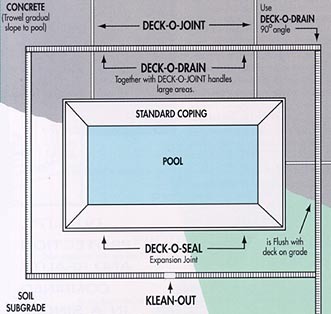 The DECK-O-DRAIN Drainage System provides an effective drainage system for concrete pool decks. This One-Piece type drain Effectively collects water and carries it away quickly. 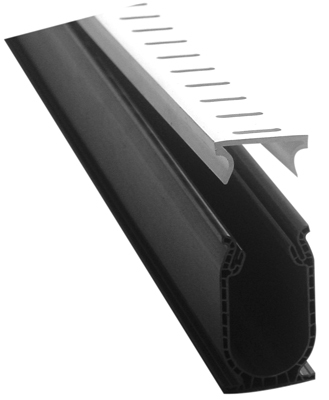 Made of tough, long lasting PVC, the Deck-O-Drain System resists wear and is non-corrosive. Both the deck and sub-grade receive watertight protection, while the DECK-0-DRAIN also serves as an effective expansion and contraction joint system. Non-Directional design eliminates the need for right or left fittings. 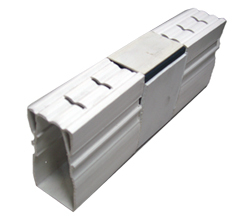 Flat contour profile allows a tight fit against any wall. Installs Easily. Couplings Snap other fittings together. Each Case has (9) Couplings included. Note: For each fitting, you will need 2 couplings. (3 for Tees, 4 for Cross Tees). Important to purchase at least one (1) Klean-out for every 50 feet, or in areas needed. Klean-outs have a lid where you can stick a garden hose into the drain and flush out debris to waste. Be sure to order All Parts Needed for your installation the 1st Time. "Adding Parts Later" may require additional work. Plan your layout. Ideal for use on pool decks, driveways, patios ... Any place water collects & needs to be carried away. Available Colors: White, Grey, or Tan. Dimensions: 1-1/2" Wide x 3 ¼" High and 10' Lengths. Each Case comes with (9) Couplings. All Deck Drains must ship via Common Carrier, and are sold by the case. No Returns on Deck Drain orders. The Advantage with the Removable Top Drain (Below) is that if the top breaks, it's easier to fix. 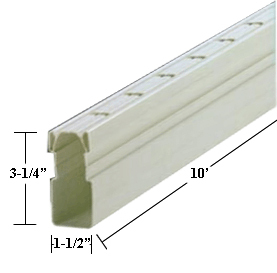 All Deck Drains must ship via Common Carrier, and are sold by the case. Deck Drains are special order items. No Returns on Special Order Items.